It may be argued that we are drawn to whatever in music that is boldly marked with personality. 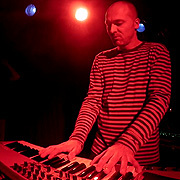 The brawny, brooding, primal realm of electronic sound realized by Dirk Jan Müller, in his highly personal effort as Cosmic Ground, does offer a distinctive synthetic substance - as well as access to the feelings of the lower plane. 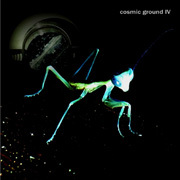 The album Cosmic Ground IV (78'26") wanders to bizarre, distant and involved coloristic regions. If a synthesizer is a tool to make sound, then electricity is the raw material - which works its will within us across this CD's seven tracks. Utilizing the darker portion of the audible spectrum the composer subjects the listener to a range of daring and captivating mental experiences. Phantasmal sonic events seem to confront underworld demons, as we move away from any concluding serenity. Along with all its foreboding, Cosmic Ground IV does give the impression that Müller takes some pleasure in the rhythmical arrangement of sound. Large-scale discharges lead to episodes of stormy grandeur, yet a swollen waltz of dancing arpeggio notes soon lights our shaky steps. However, in spite of a cerebral climax of overpowering sequencer sonority, we may still feel this music becoming darker by degrees. In ominous oscillations between Mellotron black and the comforting chords of a soft electric organ, this music is trying to say something for which words have not yet been invented. Many albums of Spacemusic simply provide pleasurable feelings to the listener. This one goes further... transmuting vague sentiments into the human sense of wonderment. Following the course of thought, Cosmic Ground IV provides a contact between two minds: that of the author and of you - who benefit from being open to the refreshment, the strengthening, and the stimulation of this work.